Select a manufactured item in your home (such as a toy or an appliance), and under adult supervision and with the approval of your counselor, investigate how and why it works as it does. Find out what sort of engineering activities were needed to create it. Discuss with your counselor what you learned and how you got the information. Discuss with the engineer a current project and the engineer's particular role in it. Find out how the engineer's work is done and how results are achieved. Use the systems engineering approach to make step-by-step plans for your next campout. List alternative ideas for such items as program schedule, campsites, transportation, and costs. Tell why you made the choices you did and what improvements were made. Transforming motion. Using common materials or a construction set, make a simple model that will demonstrate motion. Explain how the model uses basic mechanical concepts like levers and inclined planes to demonstrate motion. Describe an example where this mechanism is used in a real product. Building an engineering project. 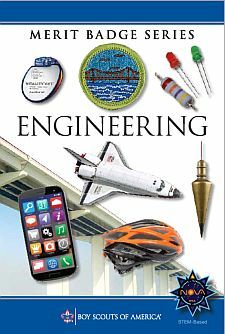 Enter a project in a science or engineering fair or similar competition. (This requirement may be met by participation on an engineering competition project team.) Discuss with your counselor what your project demonstrates , the kinds of questions visitors to the fair asked you about it, and how well were you able to answer their questions.